Fraud professionals largely view new technologies as effective for fighting financial crime. Boston, January 29, 2019 – Many U.S. financial institutions plan to upgrade or replace fraud solutions in the next one to two years, particularly for ACH, wires, and cards, and the majority plan to implement a real-time fraud solution. It is time for these technology investments to be made, or the bad guys (who are effectively using technology to conduct attacks against FIs) will gain ground that FIs can ill afford to lose. This report examines fraud loss trends and explores what types of technology investments are being planned by FIs to combat payments fraud in the next one to two years. 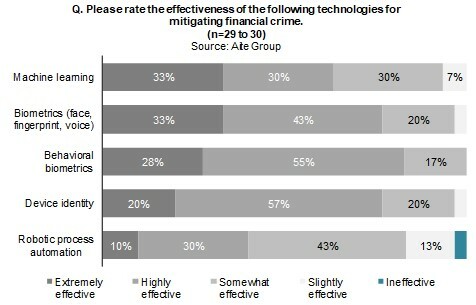 Aite Group surveyed 32 U.S. financial crimes professionals who attended Aite Group’s Financial Crime Forum in September 2018 to better understand the current and future environment for fraud trends. This 24-page Impact Report contains 17 figures and two tables. Clients of Aite Group’s Fraud & AML service can download this report, the corresponding charts, and the Executive Impact Deck. This report mentions ACI Worldwide, CA Technologies, Daon, Early Warning Services, Experian, Gemalto, Idemia, OneSpan, LexisNexis Risk Solutions, Nice Actimize, RSA, The Clearing House, ThreatMetrix, Transmit Security, and TransUnion.